AN INTERIM REPORT in to the Cork air crash nearly a year ago has identified a fault with a sensor on one of the plane’s engines. 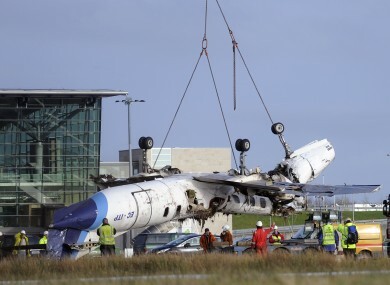 Six people died and six others survived when a Manx2 flight – whose operation was leased to Spanish aviation firm Flightline BCN – from Belfast to Cork crashed at Cork Airport on its third attempt at landing on the morning of 10 February last year. An interim statement published today by the Air Accident Investigation Unit (AAIU) said that while there were no pre-accident defects with either the engines or the propellers, a problem was found with the sensor on the right-side engine of the plane. The AAIU is required to publish a statement on each anniversary prior to the release of its Final Report which is expected within the next few months. Manx2 welcomed the publication of today’s report and said it was co-operating fully with the investigation. Today’s statement from the AAIU says that “there was a mismatch between the torques being delivered by the two engines”. The torque delivered by the number two engine on the right-hand side of the plane exceeded that being delivered by the number one engine by as much as five per cent. This effectively means there was a flaw with fuel transmission to this right-hand side engine which could have been giving more power than the left-hand engine. The statement also says that investigators found that there was a fault with the sensor on the plane resulting in an incorrect temperature reading for the right-hand side engine. As a result of this the performance of the engine was affected. Investigators also noted that Barcelona-based Flightline BCN, which had been in danger of losing its licence to fly had this licence renewed in October of last year by Spanish authorities. However it has not been licenced to fly the aircraft which was involved in the Cork air crash – Metro III. Last March, the AAIU released its preliminary report which found there were no mechanical faults with the plane. It said there had been two aborted attempts at landing prior to a fatal third attempt being made. On this attempt, the aircraft rolled to the left and then rapidly to the right before its right wing tip hit the runway surface and the aircraft overturned and came to a halt upside down on the right-hand side of the runway. Investigators are continuing to look at several other factors surrounding the crash including the the “complex relationships” between Flightline BCN and Manx2 as well as the experience and training of the pilot and the co-pilot who both died in the crash. Last week a spokesperson for the investigation told TheJournal.ie it had been a “complex investigation” but that it is “well advanced” at this stage. Air safety investigators in the UK and the United States are also involved in the investigation. We welcome the Interim Statement published today by the Air Accident Investigation Unit of the Irish Department of Transport (AAIU) which is continuing to conduct a full and thorough investigation into the crash of flight NM 7100 from Belfast to Cork, which was operated by Flightline BCN (‘the Operator’ as referenced in today’s report). Flightline BCN has so far not returned a request for comment. Email “Interim report into Cork air crash finds sensor fault on plane ”. Feedback on “Interim report into Cork air crash finds sensor fault on plane ”.